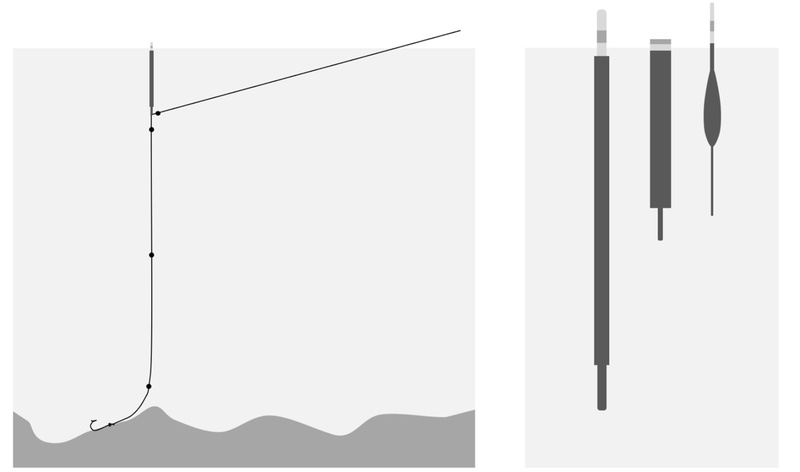 LEFT: A basic rig for still water fishing using a light peacock quill float. Re-drawn from World Class Match Fishing by Kevin Ashurst (1977). RIGHT: Three different styles of float that can easily be made from peacock quill, bamboo, brass rods, and balsa wood. The floats are shown submerged to the level required for use. Between 1974 and 1979, I spent many of my Sunday afternoons trying to catch fish from the Shropshire Union Canal near Chester. This stretch of canal was completed in 1797. It forms part of an extensive network of canals in the North-West of the UK that were built at the start of the Industrial Revolution. By 1974 the Shropshire Union Canal was no longer used for trade - it was a quiet waterway used by a handful of canal boat enthusiasts, and those local fishermen who couldn't afford to fish anywhere better. I was never a match fisherman. I was not fishing to win anything, for me a good day of canal fishing would involve me in four or five hours of intense, quiet concentration, during which I would be happy to catch five or ten small fish. I once caught a tench from the Shropshire Union canal that weighed just over a kilogram. It was by some way the largest fish that I ever caught. Many of the specialised float fishing techniques that are used on rivers, such as trotting and waggler fishing, have been designed to make use of the river's flow to present bait in an attractive way to the target fish. These techniques are not applicable on lakes, ponds, slow moving rivers, and canals. Here, the need is for a float set-up that can signal to the fisherman that the hook has moved, while minimising the resistance the fish feels as it takes the stationary baited hook. A basic still water float fishing rig is shown in the Figure above. The fishing line is usually attached to the base of the float using a small rubber band. This is a flexible arrangement that allows the fisherman to easily adjust the length of line between the float and the hook. The float is weighed down using small round split lead shot of standard sizes; No. 10 (0.04 gram), No. 8 (0.06 gram), No. 6 (0.1 gram) and No. 4 (0.2 gram) are typical for canal fishing. A number of different float designs are shown also in the Figure . In each case the float is designed to support a certain amount of shot and to provide the most stable flotation, unperturbed by wind or surface ripples, but requiring the minimum amount of force to register a bite. Although professionally made floats were widely available when I was fishing the Shropshire Union canal, I taught myself how to design and make a wide range of my own floats. I had no interest in match fishing, but from Kevin Ashurst's book, World Class Match Fishing, I learnt how to make my own floats. The raw materials required to make fishing floats were widely available - and could be bought cheaply; bamboo cane, sarkanda reed, balsa wood, crow quills, copper wire, porquepine quills, whipping thread, plastic tubes, cork, fine tying wire, and peacock quills. My favourite material for float making was peacock quill. These could be bought cheaply from most fishing tackle shops - complete with their iridescent plumage. Peacock quill is light weight, highly buoyant and naturally water resistant. Before using as a float, the feather's barbs were stripped off with a craft knife and the remaining shaft was lightly sanded. Small inserts of brass or copper wire were added to the base of the float to provide ballast and lower the centre of gravity of the float, and small lengths of bamboo cane or sarkanda reed were inserted into the top. My floats were finished in dark brown or black paint, finely sanded to remove gloss finish, and the tips painted in white and fluorescent yellow, orange or green. I implemented a simple a coding scheme of small coloured dots painted on the floats to indicate the amount of lead shot that they each one needed, to be perfectly set in the water. I no longer make floats, or fish in canals, but I do still invent and innovate. I can no longer remember what drove me to begin making my own floats. It certainly wasn't so that I could win fishing matches, and whether my own floats gave me any real advantage in catching fish from the Shropshire Union canal is hard to tell. What float-making did do, was to provide me with my first real experience of the pleasure that can be found in tinkering for a purpose. This wasn't based on an artistic creative urge to express myself without constraint, to create artistic originality. I had simply set myself the target of catching fish from the canal using my own floats. Guided by Kevin Ashurst's words and diagrams, I learnt how to experiment and play with a range of simple raw materials to make the artefacts that I needed, to my own design. 1. Ashurst, K. (1977). World Class Match Fishing. Cassell, London. 2. Fagernes, C.E., Stensløkken, K., Røhr, Å.K., Berenbrink, M., Ellefsen, S. & Nilsson, G.E. (2017). `Extreme anoxia tolerance in crucian carp and goldfish through neofunctionalization of duplicated genes creating a new ethanol-producing pyruvate decarboxylase pathway'. Scientific Reports. 7, Article number: 7884. 3. Rolfe, P. (2012). Crock of Gold: Seeking the Crucian Carp. MPress, Essex.